TH E M R EP O RT | 77 O R I G I NAT I O N S E R V I C I N G DATA G O V E R N M E N T S E C O N DA R Y M A R K E T THE LATEST DATA The American Mortgage Diversity Council (AMDC) is an independent organization focused on advancing the agenda of diversity and inclusion across the mortgage industry. Our member organizations advocate loudly and with purpose in affecting change. Join us in this important effort. Advancing the conversation of diversity and inclusion across the mortgage industry. 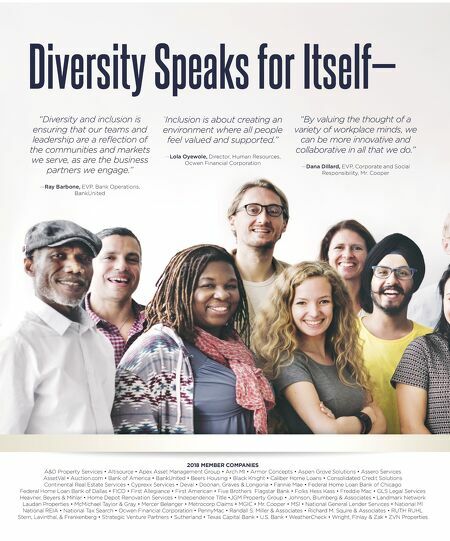 | 214.525.6700 | MortgageDiversityCouncil.com American Mortgage Diversity Council Where Diverse Groups Share Common Goals. "Inclusion not only expands our horizons but gives us a competitive edge in our marketplace." —Doris Raimundi, SVP, Mortgage Servicing Quality Control, U.S. Bank "One logical way to better understand our evolving customer base is for our industry leaders to reflect that same diversity." —Erik Richard, Founder and CEO, Landmark Network "Diversity and inclusion means a higher level of competition, a higher level of innovation, and better work culture." —Steve Thomas, Senior Managing Director, Mortgage Capital Markets, Federal Home Loan Bank of Chicago THE AMERICAN MORTGAGE DIVERSITY COUNCIL IS LEADERSHIP IN ACTION. 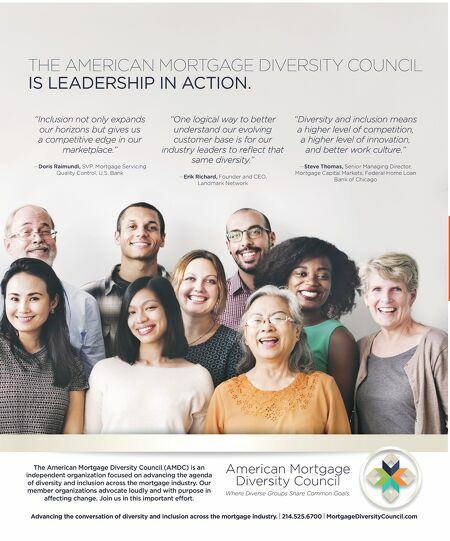 The American Mortgage Diversity Council (AMDC) is an independent organization focused on advancing the agenda of diversity and inclusion across the mortgage industry. Our member organizations advocate loudly and with purpose in affecting change. Join us in this important effort. Advancing the conversation of diversity and inclusion across the mortgage industry. | 214.525.6700 | MortgageDiversityCouncil.com American Mortgage Diversity Council Where Diverse Groups Share Common Goals. "Inclusion not only expands our horizons but gives us a competitive edge in our marketplace." —Doris Raimundi, SVP, Mortgage Servicing Quality Control, U.S. Bank "One logical way to better understand our evolving customer base is for our industry leaders to reflect that same diversity." —Erik Richard, Founder and CEO, Landmark Network "Diversity and inclusion means a higher level of competition, a higher level of innovation, and better work culture." —Steve Thomas, Senior Managing Director, Mortgage Capital Markets, Federal Home Loan Bank of Chicago THE AMERICAN MORTGAGE DIVERSITY COUNCIL IS LEADERSHIP IN ACTION.